Endurolytes Fizz offers a deliciously refreshing alternative to fulfill the body's all-important electrolyte requirements. Cramping is your body's final warning signal that you're on empty electrolyte wise. However, your performance is deteriorating and you are slowing down long before you feel the slightest twinge of a cramp. To keep your body's muscular, digestive, nervous, and cardiac systems firing on all cylinders you need a consistent supply of all electrolytic minerals, not just sodium and potassium. Plus, in many instances, you require greater volumes of electrolytes than any sports drink or gel can provide. That is why Endurolytes Fizz fulfills such a crucial component of your fueling by supplying your body with a perfectly balanced, full-spectrum, rapidly assimilated electrolyte source, allowing you to meet your widely variable electrolyte needs with tremendous precision, hour after hour, no matter what the weather throws at you. An Endurolytes Fizz tablet is equivalent to approximately two Endurolytes capsules, with each tablet scribed across the middle. This allows you to easily break the capsule in half in the event that you want a half-tablet dose, which would be equal to approximately one Endurolytes capsule. For example, if you want the equivalent of approximately three Endurolytes capsules, simply add 1.5 rapidly dissolving Endurolytes Fizz tablets into your water or fuel bottle(s). 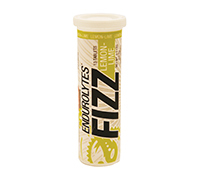 Endurolytes Fizz is economical as well, with 13 effervescent tablets in each tube, not 10 to 12 like some of the others. Unlike other effervescent electrolyte products, Endurolytes Fizz doesn't contain inconsequential amounts of vitamins or other nutrients, which only serve to increase the price. Instead, you get the full-spectrum electrolytic mineral support that you need, along with adequate amounts of auxiliary nutrients, just like you do with Endurolytes capsules or powder, but without the hefty price tag. Compare Endurolytes Fizz to the competition and you'll see that you're saving a lot of money! Superior full-spectrum electrolyte support, no inadequate amounts of insignificant nutrients, great taste, no refined sugars or artificial flavors, and the convenience of rapidly-dissolving effervescent tablets, all at a price that NOBODY can match! That’s precisely what you get with Endurolytes Fizz.